Every now and then, we bring you a profile of an interesting figure in the knife community, such as this 76-year-old knifemaker and this lifelong knife sharpener. Today, the Florida-Times Union ran a great piece about an experienced and weathered knife sharpener who runs a transient business along the highway. Phil Vanderhoof is a 59-year-old free spirit that pedals his business across state lines. That’s right pedals. 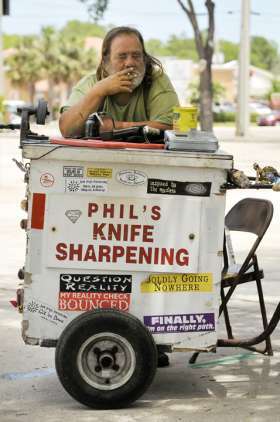 His business (and really, his life) is a small trailer with a sign advertising “Phil’s Knife Sharpening” that he attaches to his bicycle. In the trailer is a hand-turned grinding wheel he estimates is about 75 years old. He also carries a variety of oil stones to do some of the finer work. Despite having done this for more than 20 years, he didn’t have any professional training sharpening knives, but learned a few tricks and techniques in the Boy Scouts and the Marines. He was good enough that people kept stopping him on the side of the road on his bike to sharpen their knives. So, he decided to simply attach a sign and set up shop wherever he wanted. The great thing about his business is that he runs a great bargain. Most knives cost between $2 and $5 while a handful of swords might run you about $30. If you’re interested in getting this guy to sharpen your knives, finding him is gong to be difficult. He might be seen up and down the East coast on docks sharpening the knives of deckhands or in Daytona sharpening samurai swords on the side of the road. He spent last year along the Mississippi River, but he’s pedaled his life and his business as far north as Michigan, as far west as Arizona. Phil Vanderhoof’s lifestyle might be peculiar to most, but there’s no denying this knife sharpener lives life on the edge. Sword-Wielding, Waterskiing Fish Hunters: Smart or Insane?